Just Taylor: Review: Micellar Cleansing Water. Hi guys! 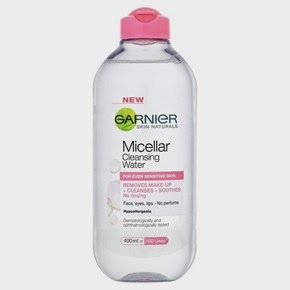 A couple of weeks ago I made a post on a haul which included the Garnier Micellar Cleansing Water. I've been using this for the past couple of weeks and I thought I would give you all a short review on how I am finding the product so far! I'm about 1/4 way through the bottle already and I have to say, this is quite an amazing product. As the title suggests, the product is water based therefore when you apply it, it feels light to the skin and removes all of your makeup in a couple of swipes. Normally, I use two large cotton pads with this cleansing water applied on to it and it removes my makeup completely. The thing I like most about this product is that it doesn't feel heavy on the skin afterwards and I don't feel as though I need to wash my face after using it. In the past I've used cream removers and oil-based cleansers and they seem to leave an awful residue on my skin afterwards. In a 400ml bottle you can supposedly get 200 uses, which to me is amazing considering the quality of the product and the fact that it is also inexpensive. The product claims to be 'an easy way to remove makeup, soothe and hydrate the face, eye area, and lips, in 1 step without rinsing', on the back of the bottle. I completely agree with this statement and I would completely recommend this to anyone that is looking for a cheap yet effective cleanser. Have you tried this product? Do you have any recommendations?